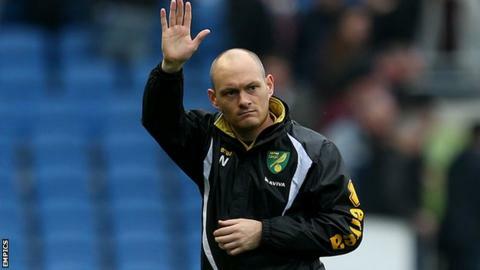 Norwich manager Alex Neil headed straight to the airport for a Uefa coaching course after the Championship play-off semi-final draw at Ipswich. The 33-year-old former Hamilton boss saw his side draw 1-1 away at their East Anglian rivals, with the game in the balance going into the second leg. But he barely had time to take it in, needing to catch a flight to Glasgow. "You never get a day off, even when you're in the house you're on the phone, that's the job," said Neil. The Canaries' resurgence since the 33-year-old took over from Neil Adams saw them finish third in the Championship following a run of 15 wins out of 22 matches. Norwich have not lost away from home in 2015, and looked set for another victory when Jonny Howson put them ahead, but Paul Anderson's equaliser meant the 99th East Anglian derby, on 16 May (12:15 BST kick-off), will be one of the biggest yet. "We're exactly as we were before the game started," said Neil. "The only thing that gives us an advantage, if any, is the fact we're at home, but I'm sure Ipswich were thinking the same before today. "Over the course of the 90 minutes, it's just about who performs best on the day."